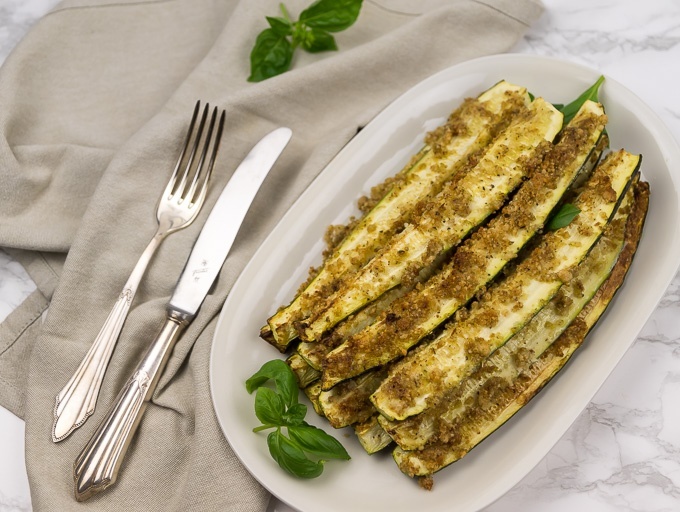 Ever since I came across the great recipe for Baked Parmesan Zucchini at Damn Delicious I wanted to try out a vegan version. So, here is the adapted recipe, really simple to make and extremely tasty. I used my basic recipe for vegan parmesan and enhanced it by a few ingredients, such as garlic and an Italian herb mix. 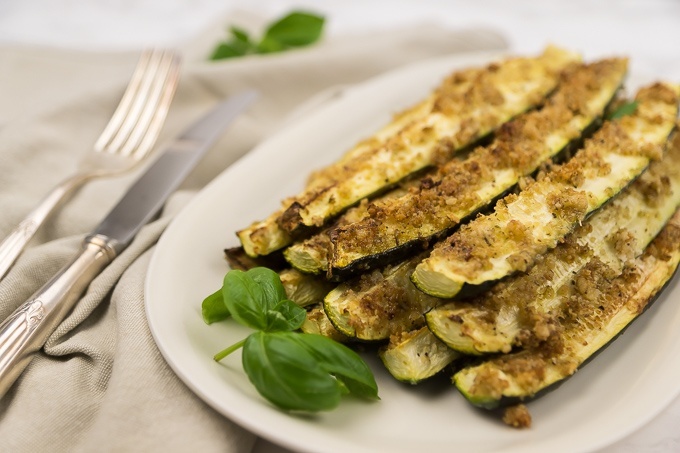 Now imagine sprinkling this vegan parmesan on zucchini slices and roasting them in the oven. The result is pure bliss! A light, healthy, and yummy veggie dish that you can serve as a starter or a side dish, or just have it as a little snack in-between meals. Either way, I’m pretty sure that it will become a staple. Preheat the oven to 180° C (fan on). Wash the zucchini, cut off the ends, and quarter the zucchini lengthwise. 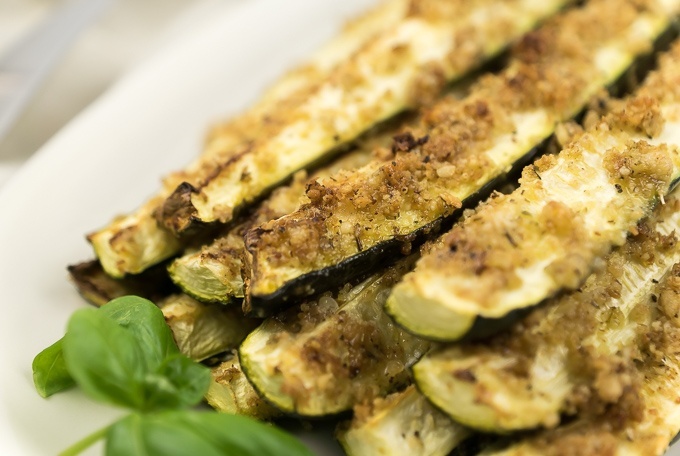 Line a baking tray with parchment paper and spread the zucchini sticks with the cut side upwards onto the tray. 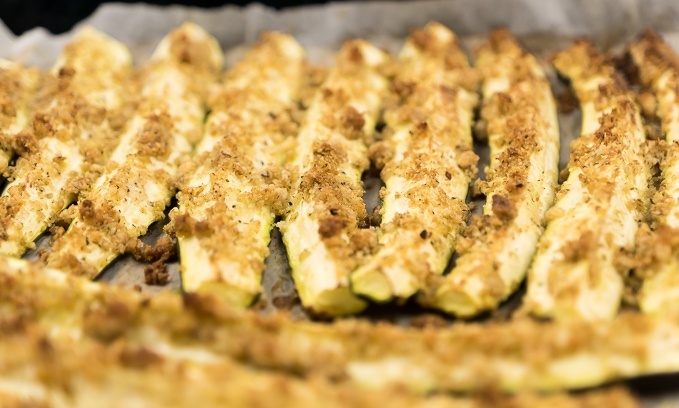 Using a pastry brush, coat the zucchini sticks with about 1 tablespoon of olive oil. 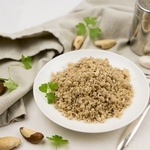 For the vegan parmesan, coarsely grind the Brazil nuts and mix with the other parmesan ingredients. 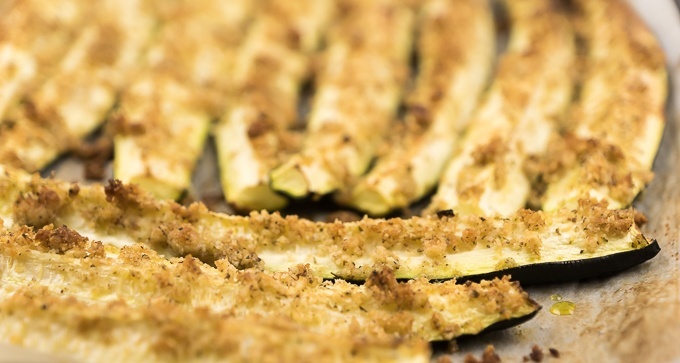 Coat the zucchini sticks with parmesan. I used my fingers to tap about ½ to ¾ of the parmesan onto the zucchini. Bake the zucchini sticks on the lowest rack for about 20-30 minutes, until they are golden brown. Serve hot out of the oven, sprinkled with olive oil, basil leaves, and any leftover parmesan.